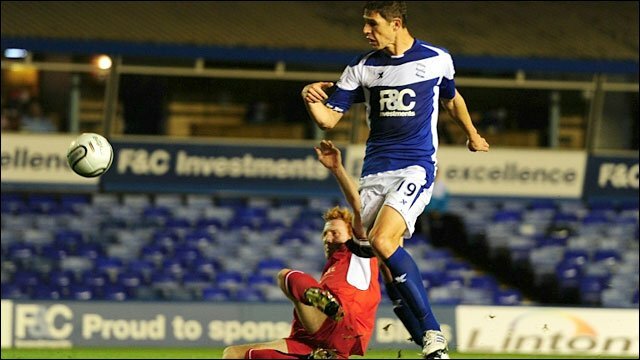 A three-goal burst in four minutes helped Birmingham beat MK Dons in the third round of the Carling Cup. Jean Beausejour set up Alexander Hleb to guide in a 24th minute shot before finding Nikola Zigic to turn the ball in two minutes later. Substitute Craig Gardner's left-foot 25-yard shot after 28 minutes then left the visitors stunned. Aaron Wilbraham grabbed a consolation for MK Dons when he slotted in after a Jabo Ibehre shot had been blocked. Birmingham boss Alex McLeish had made nine changes to his team following their 3-1 defeat by West Brom at the weekend but his side were still too strong for their League One opponents. Beausejour, along with Martin Jiranek, was making his first start for the club and certainly impressed as he cut the ball back from the left for Hleb to control and guide in a shot from the edge of the box. That was Hleb's first goal for Birmingham and Zigic also opened his account when he sidefooted in from close range after a looped cross from Beausejour. Michel was forced off for the home side but that had only brought Gardner into the fray and his long range strike put his side out of sight. 90:00+3:04 The referee blows for the end of the match. 90:00+1:27 The ball is sent over by Luke Chadwick, clearance by Craig Gardner. Peter Leven takes a shot from deep inside the box clearing the bar. 90:00+0:48 Kevin Phillips takes a shot. Dan Woodards gets a block in. 87:53 Foul by Matt Derbyshire on Dean Lewington, free kick awarded. The free kick is swung in left-footed by Peter Leven. 86:46 Roger Johnson fouled by Gary MacKenzie, the ref awards a free kick. Maik Taylor takes the free kick. 85:09 Free kick awarded for a foul by David Murphy on Aaron Wilbraham. Strike on goal comes in from Peter Leven from the free kick. 84:43 The ball is crossed by Dan Woodards, Maik Taylor makes a comfortable save. 82:14 Corner taken by Keith Fahey, Unfair challenge on Lewis Guy by David Murphy results in a free kick. Free kick taken by David Martin. 79:38 GOAL - Aaron Wilbraham:Birmingham 3 - 1 MK Dons Aaron Wilbraham scores a goal from inside the box to the bottom right corner of the goal. Birmingham 3-1 Milton Keynes Dons. 78:46 A cross is delivered by Matt Derbyshire, Gary MacKenzie makes a clearance. 77:19 Dean Lewington sends in a cross, Martin Jiranek gets a block in. Outswinging corner taken left-footed by Peter Leven from the left by-line, Dan Woodards takes a shot. David Murphy makes a clearance. 76:05 Free kick awarded for a foul by Aaron Wilbraham on David Murphy. Direct free kick taken by Roger Johnson. 75:39 Unfair challenge on Martin Jiranek by Jabo Ibehre results in a free kick. Free kick taken by Craig Gardner. Nikola Zigic challenges Mathias Doumbe unfairly and gives away a free kick. David Martin takes the free kick. 74:01 Shot by Kevin Phillips went wide of the left-hand post. 72:15 Stuart Parnaby produces a cross, Close range header by Nikola Zigic goes wide of the left-hand post. 70:01 Enric Valles takes a shot. Blocked by Dan Woodards. Corner taken short by Enric Valles. The ball is crossed by Keith Fahey, Martin Jiranek produces a left-footed shot from inside the area that clears the bar. 68:40 Corner from the left by-line taken by Peter Leven, save by Maik Taylor. 68:28 The ball is crossed by Dan Woodards, clearance by Martin Jiranek. 65:38 Craig Gardner takes the free kick. 65:38 Substitution Kevin Phillips replaces Alexander Hleb. 65:38 Free kick awarded for an unfair challenge on Alexander Hleb by Mark Carrington. 63:33 Substitution Aaron Wilbraham replaces Jermaine Easter. 63:33 Shot from 30 yards by Lewis Guy. Save made by Maik Taylor. The ball is delivered by Dean Lewington. 63:11 Free kick awarded for a foul by Craig Gardner on Jermaine Easter. Direct free kick taken by Dean Lewington. 59:03 Free kick awarded for a foul by David Murphy on Lewis Guy. David Martin takes the free kick. 58:34 The offside flag is raised against Matt Derbyshire. David Martin takes the free kick. 57:01 Gary MacKenzie challenges Nikola Zigic unfairly and gives away a free kick. Free kick taken by Craig Gardner. 57:01 Substitution (Birmingham) makes a substitution, with Enric Valles coming on for Jean Beausejour. 54:53 Mark Carrington takes a shot. Maik Taylor makes a save. Corner taken by Peter Leven from the left by-line, Header from deep inside the penalty area by Dan Woodards goes harmlessly over the crossbar. 54:10 Jermaine Easter sends in a cross, clearance made by Keith Fahey. 52:42 The ball is delivered by Lewis Guy. 52:03 The assistant referee signals for offside against Jean Beausejour. David Martin takes the indirect free kick. 51:40 The ball is delivered by David Murphy, Dean Lewington makes a clearance. 50:36 Unfair challenge on Mark Carrington by Nikola Zigic results in a free kick. Direct free kick taken by David Martin. 49:34 Lewis Guy crosses the ball, Martin Jiranek manages to make a clearance. 48:53 Free kick awarded for an unfair challenge on Jabo Ibehre by Nikola Zigic. Direct free kick taken by Peter Leven. 47:11 Stuart Parnaby delivers the ball. 45:56 Jabo Ibehre challenges Matt Derbyshire unfairly and gives away a free kick. Stuart Parnaby takes the free kick. 45:01 Substitution Gary MacKenzie joins the action as a substitute, replacing Sean O'Hanlon. 45:00+3:04 The referee calls an end to the first half. 45:00+2:36 Nikola Zigic takes a shot. Blocked by Mark Carrington. 45:00+1:18 The referee blows for offside against Jermaine Easter. Martin Jiranek takes the indirect free kick. 45:00+0:34 Foul by Mathias Doumbe on Matt Derbyshire, free kick awarded. Direct effort from the free kick comes in from Craig Gardner, Mark Carrington gets a block in. 42:03 Dan Woodards takes a shot. Blocked by Roger Johnson. Outswinging corner taken from the left by-line by Peter Leven, Dean Lewington has a headed effort from close range and clears the bar. 41:27 The ball is crossed by Stuart Parnaby, David Martin makes a comfortable save. 40:53 A cross is delivered by Jean Beausejour, Peter Leven manages to make a clearance. 40:11 Martin Jiranek gives away a free kick for an unfair challenge on Jabo Ibehre. Free kick taken by Peter Leven. 38:44 Lewis Guy takes a shot. Save made by Maik Taylor. 36:51 Jabo Ibehre challenges Alexander Hleb unfairly and gives away a free kick. Direct free kick taken by Keith Fahey. 36:12 Jermaine Easter challenges Roger Johnson unfairly and gives away a free kick. Maik Taylor takes the direct free kick. 34:46 Jermaine Easter sends in a cross, Jabo Ibehre takes a shot. Roger Johnson gets a block in. Inswinging corner taken by Peter Leven, Headed effort from inside the area by Dean Lewington misses to the left of the target. 33:23 Peter Leven delivers the ball, save made by Maik Taylor. 31:29 The ball is sent over by David Murphy, Header on goal by Nikola Zigic from just inside the area goes over the target. 29:08 Foul by Jean Beausejour on Dan Woodards, free kick awarded. Sean O'Hanlon takes the free kick. 28:52 Jean Beausejour crosses the ball, blocked by Sean O'Hanlon. 28:28 Substitution Angelo Balanta leaves the field to be replaced by Jabo Ibehre. 27:29 GOAL - Craig Gardner:Birmingham 3 - 0 MK Dons Craig Gardner grabs a goal from outside the penalty box to the bottom right corner of the goal. Birmingham 3-0 Milton Keynes Dons. 25:50 Jean Beausejour provided the assist for the goal. 25:50 GOAL - Nikola Zigic:Birmingham 2 - 0 MK Dons Nikola Zigic finds the back of the net with a goal from inside the six-yard box to the bottom right corner of the goal. Birmingham 2-0 Milton Keynes Dons. 25:28 Foul by Angelo Balanta on Martin Jiranek, free kick awarded. Maik Taylor restarts play with the free kick. 23:48 The assist for the goal came from Jean Beausejour. 23:48 GOAL - Alexander Hleb:Birmingham 1 - 0 MK Dons Alexander Hleb scores a goal from the edge of the penalty box to the bottom right corner of the goal. Birmingham 1-0 Milton Keynes Dons. 22:13 Substitution Craig Gardner joins the action as a substitute, replacing Michel. 20:24 Free kick awarded for an unfair challenge on Michel by Peter Leven. Direct free kick taken by Martin Jiranek. 19:59 Stuart Parnaby crosses the ball, Mark Carrington manages to make a clearance. 19:22 The offside flag is raised against Lewis Guy. Indirect free kick taken by Maik Taylor. 16:17 Free kick awarded for a foul by Michel on Jermaine Easter. Dean Lewington takes the direct free kick. 15:37 David Murphy delivers the ball. 14:32 The ball is delivered by Jean Beausejour. 13:19 Shot on goal by Angelo Balanta from just inside the area goes over the target. 11:57 Centre by Matt Derbyshire. 11:25 The assistant referee signals for offside against Matt Derbyshire. David Martin restarts play with the free kick. 9:29 The official flags Matt Derbyshire offside. Free kick taken by David Martin. 9:00 Lewis Guy is flagged offside by the assistant referee. Free kick taken by Maik Taylor. 5:20 The ball is delivered by Dan Woodards, clearance made by Stuart Parnaby. 3:46 Unfair challenge on Alexander Hleb by Luke Chadwick results in a free kick. Direct free kick taken by Michel. 1:33 Unfair challenge on Nikola Zigic by Mark Carrington results in a free kick. Free kick taken by Michel. 0:55 Foul by Nikola Zigic on David Martin, free kick awarded. David Martin takes the free kick. 0:28 Centre by Lewis Guy.